These tomato recipes are great to make, especially when you can get some good deal on tomatoes. There are a number of ways to incorporate tomatoes in daily cooking. The ever so famous tomato soup, a simple yet gorgeous tomato salad, grilled tomatoes, tomato rice, tomato salsa, tomato sauce for pasta, so on and so forth. * Tomatoes are a good source of potassium and beta carotene. * Also a good source of vitamin C and E.
* Tomatoes contain lycopene - the carotenoid pigment that gives them a red color, which acts like an antioxidant and may prevent against forms of cancer by reducing the damage caused by free radicals. * Low in calorie - so form an excellent ingredient for a weight loss program or diet. So Why not try a few recipes using tomatoes. Inspired by a south Indian soup called 'rasam', this tomato recipe is slightly different from the authentic. 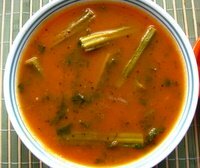 I have used vegetable drumsticks as well to make this a super dee duper soup. This soup helps in digestion. Drumsticks (vegetable) is good for reducing blood pressure. If you are not familiar with what a vegetable drumstick is, here is a short description. Moringa oleifera, commonly referred to simply as moringa, is a very nutritious vegetable tree. The moringa pods or it's fruit is what is known as vegetable drumstick (because it looks like a drumstick). In Hindi they are called sahjan ki falia, in Tamil it is murungai. They are very good for people with high blood pressure and diabetes. Also it's addition in this recipe adds an additional flavor. You can always omit this if not available. Roughly chop the tomatoes and put in a pressure cooker with a cup of water and cook till the first whistle. Let the pressure settle, then puree all the tomatoes along with the water. Pass this puree through a sieve if you want to get rid of any seeds. Meanwhile prepare the drumsticks and cut into 4 inch pieces. If using the vegetable drumstick for the first time, this is how you can prepare it. Wash and pat dry, snip off the tip by using a knife and just before you have almost completely snipped it off, do a peeling action. you will see that a little skin comes off. That's it, all you have to do is peel a little skin off, not all, just little and cut it into 4 inches long pieces. Then boil them in little water for 5 minutes or steam them in a microwave for 4 minutes. Keep aside. In a pan heat the oil. Add mustard seeds and let them sputter. Now add the cumin seeds, curry leaves, green chilies, asofetida and garlic. Cook for a minute and then add the pureed tomatoes and 2-3 cups of water. This is meant to a be a watery soup. Cook for another 5 -10 minutes. Add salt, black pepper, steamed drumsticks and cook another minute or so. Garnish with coriander. Enjoy the spicy tomato soup. Please note :-You should not eat the whole drumstick as it is. Just scoop out the pulp and seeds out of the drumstick and eat that, throw the rest away.